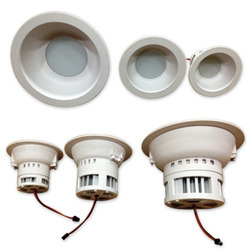 We are one of the leading manufacturer of Glacier Down Lights. Our products are widely appreciated among our clients and demanded all across the globe for its higher performance in terms of installation, lightening efficiency, energy saving and lifetime fixtures. Firefly Mumbai is one of the pioneered organizations engaged in manufacturing of Led Flat Panel, LED Panel lights, Flat Panel lights, Sunflower Down Light, Square Down Light Range, Glacier Down Light, LED Street, LED Street Light and Led Industrial Hi-bay. Our products are widely known for its durability and flawlessness. Being a client-centric organization and for attaining maximum client satisfaction, our products are procured from the trusted vendors and are made using high-grade tools and techniques. In addition our products are stringently quality tested under various parameters with our in-house quality testing unit before the final delivery of the products to our esteem clients. With the help of our trusted vendors we have been to build our trust among the reputed industries by providing them the qualitative range of products to our clients. Our professional leave no stone unturned to fulfill the diverse increasing demands of our clients. We have a well-equipped infrastructure which consists of all kinds of equipments required for the production process. Our products are manufactured with the latest technology machines maintaining the international standards and are availed at Market leading prices. In addition, our we have a ultra modern warehousing system which is capable of storing the bulk products and keep them safe from all kinds of damages. We have a computerized management system which is helpful in providing us a hassle free delivery of a quality assured range of products which is flawless and provides maximum efficiency.